The Frog and PenguINN: Disturbing But True . . . Disturbing But True . . . In previous posts, I mentioned my enjoyment in listening to podcasts, which some folks may or may not be familiar with or enjoy. Listening to them is how I get through gym sessions. I've heard countless interesting, unbelievable, and unsettling "stories" and prefer those based on true events. This post focuses on a recent podcast episode which took me by surprise as it described an event in U.S. history about which I was ignorant. Spoiler alert: The topic may be very upsetting to readers (as it was to me). A favorite podcast of mine, Radio Diaries, provides short segments of history narrated by producer Joe Richman. (The program is a member of Radiotopia from the Public Radio Exchange (PRX) and based in Cambridge, MA.) The February 20, 2019 episode, When Nazis Took Manhattan, described a chillingly true event which happened in 1939, exactly 80 years earlier on the same February date. The podcast host and his guest discussed a documentary film about this event/rally, which can be viewed online. 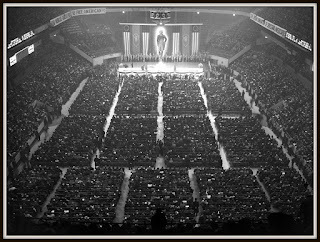 The rally was organized by the German American Bund (Amerikadeutscher Volksbund) a pro-Nazi organization comprised of American citizens of German descent living in the U.S. The group, established in 1936, succeeded the former Friends of New Germany (FoNG), which disbanded after press and governmental and criticism for being "unpatriotic." The name change was done to bolster the group's "American" credentials. Led by Fritz Kuhn, a German-born, naturalized American citizen. Bund membership was in the thousands with "training camps" in several states. The Bund disbanded after the start of World War II. Kuhn was arrested for embezzling funds, sent to prison, stripped of U.S. citizenship and deported in 1945 to West Germany where he died. Now, about that NYC rally. 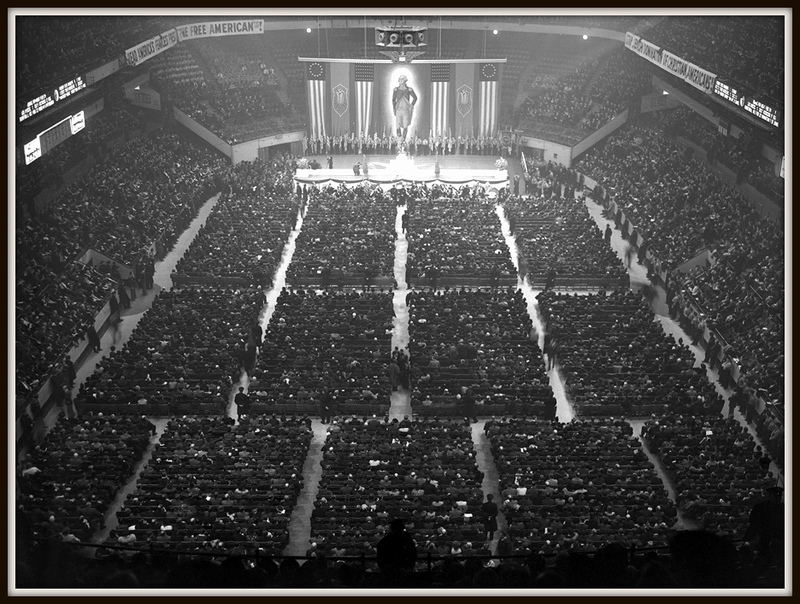 On February 20, 1939, the Bund held “A Pro-American Rally” inside Madison Square Garden attended by 20,000 supporters and members to celebrate the rise of Nazism in the U.S. The deliberately-selected date was the birthdate of first U.S. president George Washington's and featured a very oversized banner of him flanked by large American flags and swastikas. Almost 2,000 NYC police officers were onsite for crowd control to hold back anti-Nazi protestors. Caution — the film is NOT easy to watch. Click the link at your own discretion. 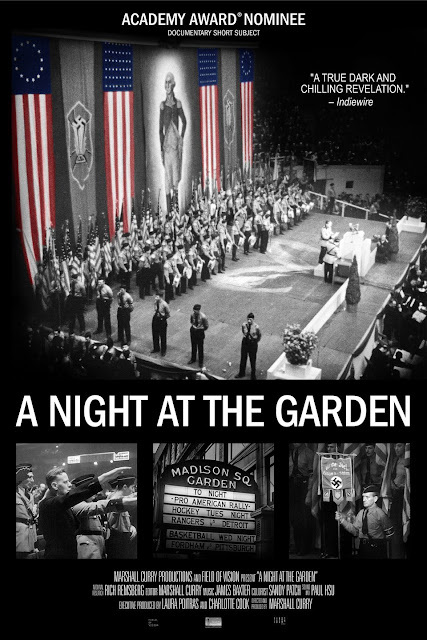 A Night at the Garden was created entirely from archival film footage and can be viewed online here. 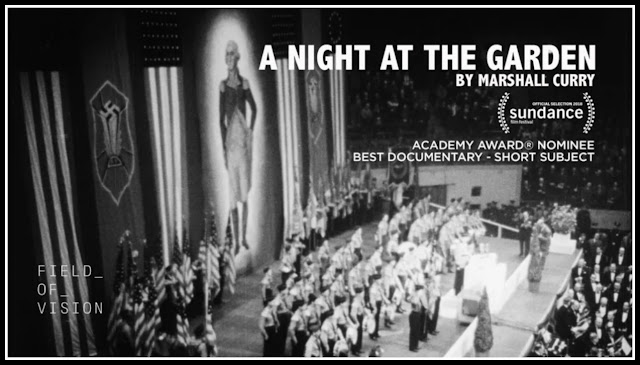 The less than 7-minute film shows the rally and vividly display anti-Semitism in America at that time. Huge crowds are shown inside and outside the event. Without revealing everything, the sight of uniform-garbed attendees, attendees reciting the pledge of allegiance and giving the one-handed "salute", also an orchestra playing the national anthem was very disturbing. Kuhn, the featured speaker, delivers appalling rhetoric. He rants about what he calls the "Jewish-controlled media" and says "it’s time to return the U.S. to white Christians" who, he continues, "founded the nation." Brett Siciliano was the special guest interviewed on the Radio Diaries podcast. He described how his grandfather, Isadore Greenbaum, a 26-year-old Brooklyn plumber, charged the stage during Kuhn's speech. He was set upon and attacked by Bund supporters who ripped off his pants before NYC police officers took charge. (This attack can be seen in the film.) Greenbaum's injuries included a black eye and broken nose. He was arrested for disorderly conduct and fined $25. 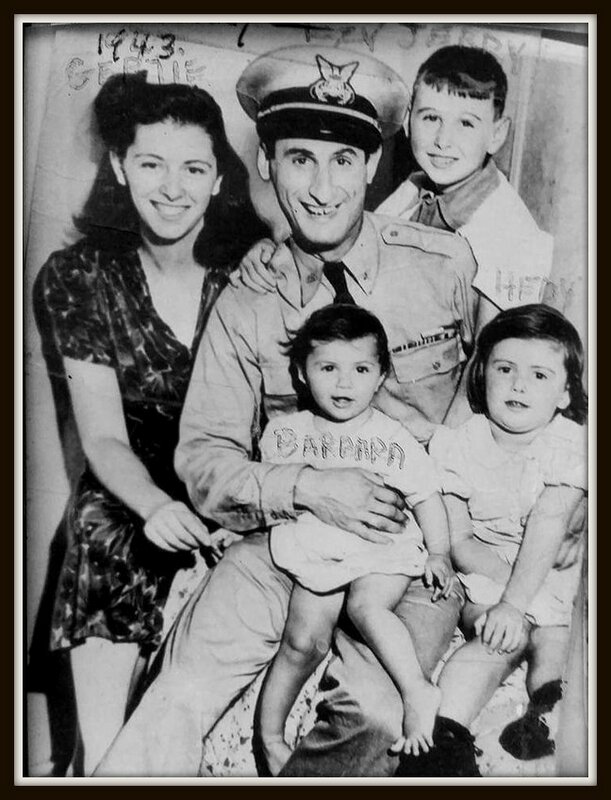 Later, he enlisted in the U.S. Navy and fought against the Nazis. The film directed and edited by Marshall Curry was supported and released by Field of Vision. It was an official selection at the 2018 Sundance Film Festival and was nominated for a 2019 Academy Award for Best Documentary Short (which it did not win). In conclusion, this was a long post on an event and group that I was admittedly unfamiliar with before listening to the Radio Diaries podcast. The topic raised my awareness, assailed my conscience and compelled me to compose this post. My intent was not to offend or upset anyone, other than sharing my angst that this could and did happen in the U.S. Sadly, hate groups still exist in America and other countries. This is but one example of why it is so important to know about our history and not try to erase it. It makes us feel good to remember the good events. We need to remember the bad ones and try to learn from them. Bravo to the podcaster and bravo to you for reminding us all. I have heard of the incident and the documentary, but hadn't seen it yet. Let me also echo Emma's comment! That is why it is so important to learn our history, all of it. Your last sentence is what I worry about too. we have too much hate in North America where we have it good. I have never tried a podcast . Must do it! Lots of people talk about how great they are. Thanks for sharing. I had no idea. Thanks for sharing. I think. I'll share this with Sue who listens to podcasts. I don't think she's ever mentioned this one. Hate groups cannot be prevented in any society, but people can learn to be on the alert and not be victims of these groups. For example, I'm of jewish faith and I thoroughly dislike the fact that most of the FED top economists are jewish. That's dinamite, why? because the Fed is supposed to help the Presidents make the american people believe everything is under control, when nothing actually is under control (see the deficit). This will explode someday (it's getting close) and the jews will (rightly) be accused. This is only one tiny example, there are more. Keep away from such places and jobs - is my advice. Sometimes we do get shocked when learning about our past. The way the aborigines were treated in our country is horrific. Its not much better now. I heard about this but haven't seen the documentary. All part of history Dorothy. It is important to be aware of these events. Brett Siciliano was a very brave man. Thank you for sharing. I'm a big fan of Podcasts and I will definitely look into this one. I have some lighter ones to counter balance the serious nature of this one. We are at a place where it is so easy for everyone to hate anything and everything..........I wonder what happened to "teaching tolerance?" Your post reminds us exactly why we must keep history know and not try to erase or rearrange it! this is great post dear Dorothy!